Non-enveloped, flexuous, filamentous, 600-1000 nm or more long and 12-13 nm in diameter. Linear ssRNA(+) genome of 6.5-9 kb in size. The 3' terminus is polyadenylated and, in some genera, the 5' end is capped. Encodes 2 to 6 proteins. 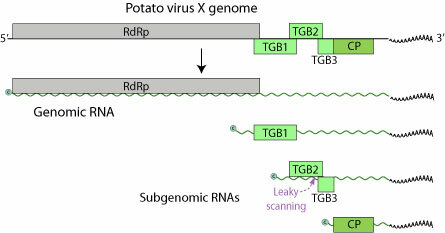 Citrus leaf blotch virus movement protein acts as suppressor of RNA silencing . Apple chlorotic leaf spot virus 50 kDa movement protein acts as a systemic suppressor of RNA silencing through phloem .